Hello! 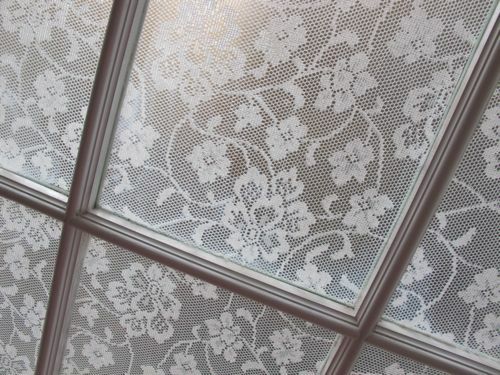 I’ve been blown over by the response to my post about our lace window treatment made with cornflour. Thanks everyone! I thought I’d pop in with the answers to come of the common questions from the comments section. Here’s some pictures (I had to stick my had out of the window to demonstrate as we couldn’t take a pic from outside!) 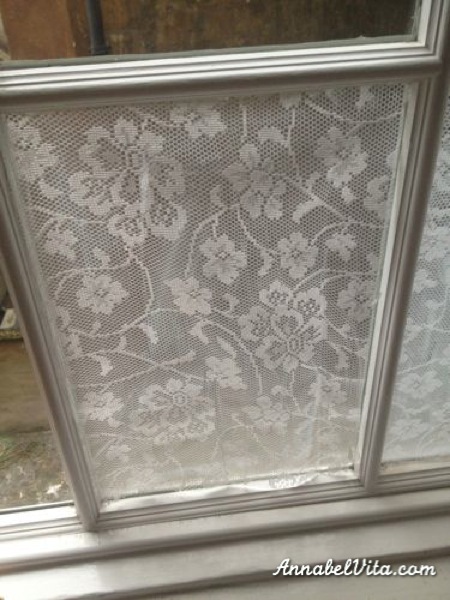 to give you a better idea (remember, a thicker lace would give you more coverage). 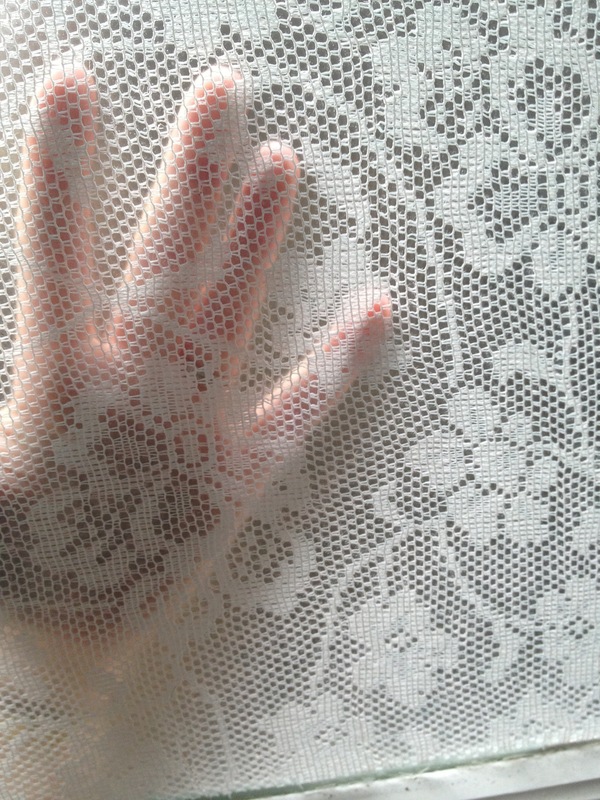 And this one is my slightly stubby arm reach out as far as it can, you can just make out my fingers. A: You make a paste with equal parts cornstarch/cornflour and hot water and then add extra boiling water. In my case it was two tablespoons cornflour and two tablespoons water to start with and then I mixed in a cup and a half of boiled water from the kettle. Q: What about mod podge? Would that work as well? Q: Can I see a picture from the outside. 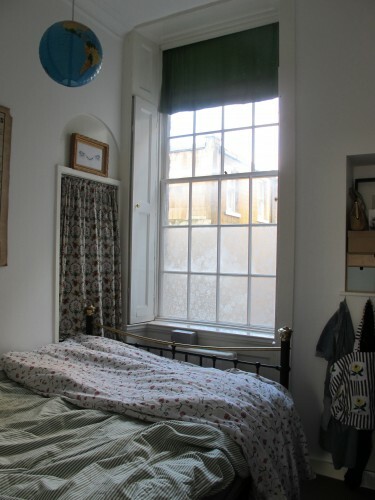 A: Sadly this isn’t possibly in our flat, but Michal did this window treatment in her gorgeous over the door window and put up some pictures on her blog. It looks amazing! 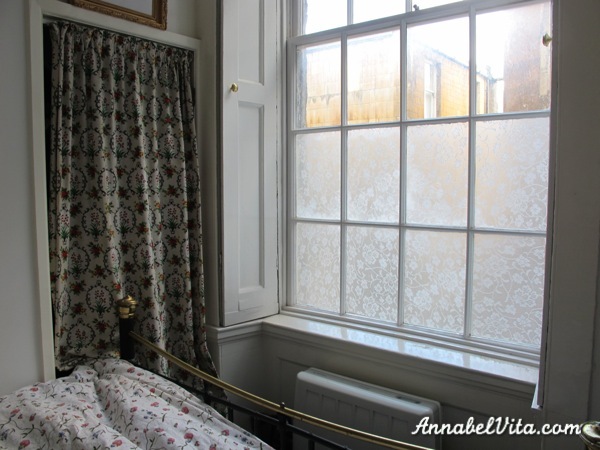 It’s well worth popping by her blog to see how pretty this looks from the inside, too. 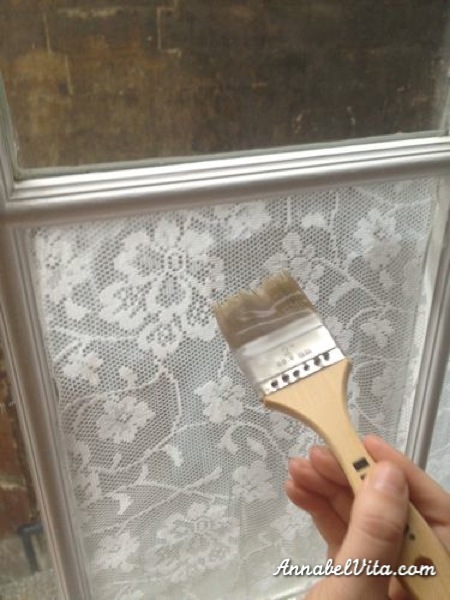 This entry was posted in decor tweaks, DIY, Our Flat and tagged cornflour, Lace window treatment with cornstarch on September 30, 2013 by Annabel Vita Admin. 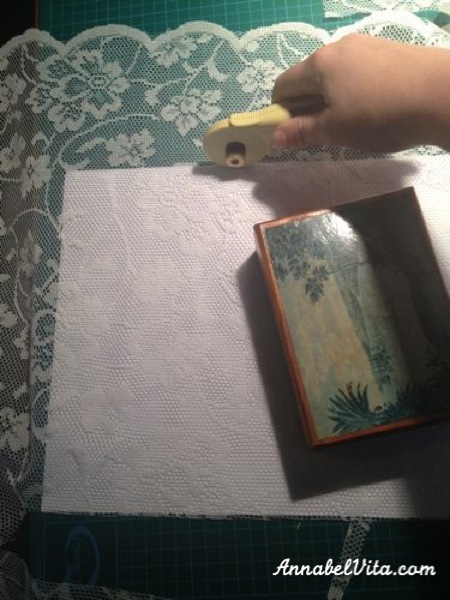 Ok, so there are other blogs out there where you can go for your perfect Martha-Stewart style crafts. I’m more of a I’m-already-five-minutes-late-when-inspiration-strikes kinda crafter. The sort you don’t feel in the least bit intimidated by, in other words (mainly because anything I make always looks a little like your average eight year old could have done better). Anyway. The other day I was putting together a birthday parcel for my mum. As I was digging around in my wrapping drawer I found a bunch of ugly but fun party hats and some fabric I’d been saving (actually the cut off legs of a pair of pyjamas that had sadly died). Even though, as I said, I was already late, I thought I’d use the two to make my mum a unique little birthday hat to put on her cute head. The rest is so easy you’ve probably already worked it out, but just in case. Tape along that line with tape. 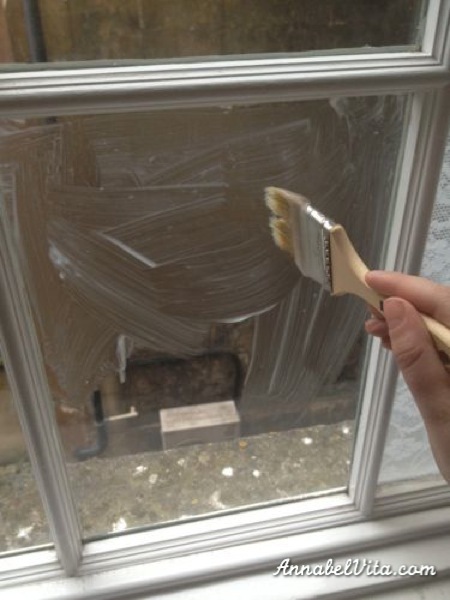 The next bit required two hands so there’s no pictures. But you need to stick the bottom of the fabric to that double sided tape. Then trim the fabric just past the point where the two ends meet (you want a bit to cover the masking tape. Then I swept the excess height of the fabric up and around the cone (I was going for a princessy vibe!) and tied it in a bow. Is it perfect? No. Would it make you smile if you received it in the post on your birthday? I reckon. 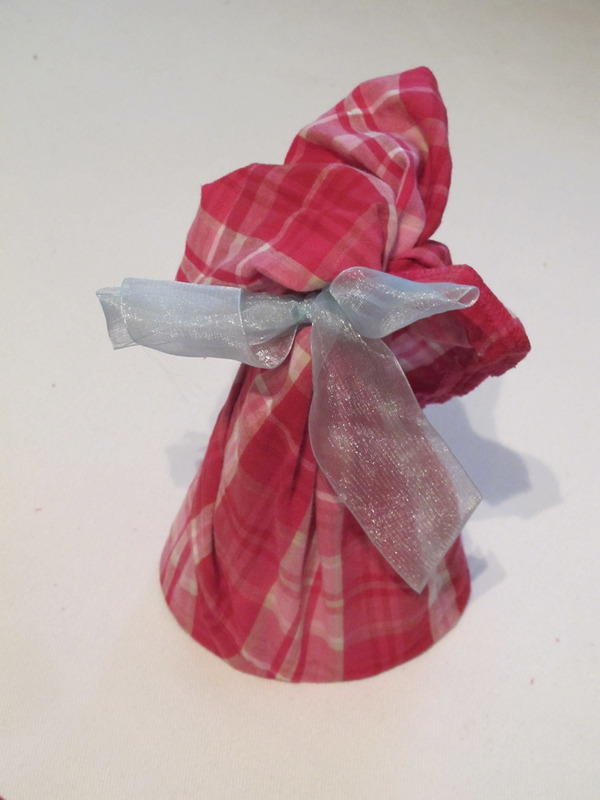 I’ll be back tomorrow or later in the week with more details with the rest of the party-in-a-parcel I sent my mum. Here’s the finished party in a parcel! This entry was posted in DIY, Everything else, Parties and presents on November 15, 2011 by annabelvita.